Adding a new hue to your building exterior is an excellent way to refresh the looks of your home and to enhance its curb appeal – try these exterior painting tips and you will surely be happy with the results. Type – the two most common types of exterior paint are oil-based and latex (water-based) paint. Oil paint dries faster and it is the only solution for painting surfaces that have been previously painted with oil-based paint, while latex paint is the best choice for areas that get wide temperature variations. Finish – glossy paint is the most resistant, but it reveals imperfections, satin paint works best for siding panels that are in good condition, while flat paint has excellent concealing qualities, which makes it the best choice for siding that is dented or scratched. Don’t forget the primer either – you will need it to allow the paint to adhere to the surface and it is absolutely essential if you will be painting on a surface already painted in a dark or bright color. 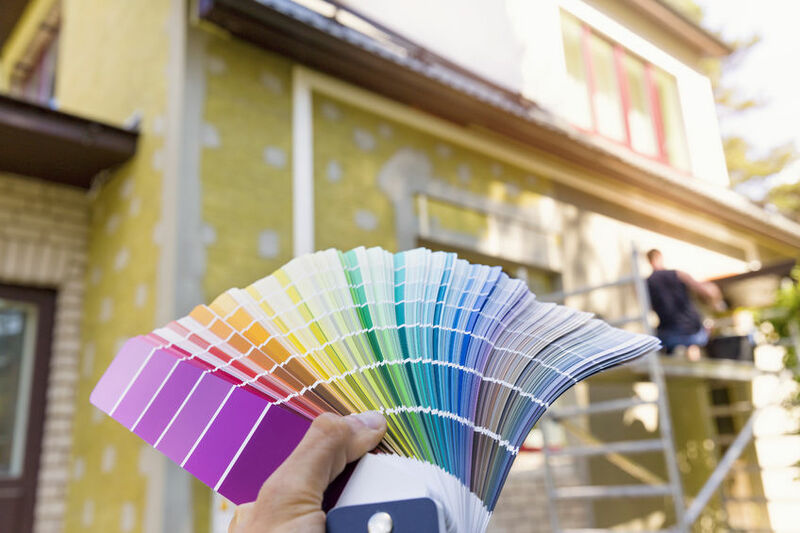 To make the most of your painting project, try to choose a color that integrates with the color of the unmovable elements in your immediate surroundings, such as the stairs, the pathway or the driveway. Pick a color that suits the architectural style of your building as well – classic buildings look better in toned-down colors, while a bold exterior design calls for bold colors. You will need some drop cloths to protect the ground and the vegetation in the area in which you paint, some foil to protect doors and windows, a stable ladder, devices to clean the walls and tools to apply the paint. For wall cleaning, you can use a pressure washer, but you will certainly find some residues that stick to the walls after the washing, so you will need some sand paper, a paint scraper and a spackle knife to remove the residues completely. To apply the paint, you will need a paint sprayer or a paint roller, depending on how you want to apply the color and a few brushes for the areas that cannot be reached with a larger device. If the wall has imperfections, such as cracks or dents, you will need some exterior caulk and a caulking gun to smoothen the surface. To make sure the paint sticks to your walls evenly, you need to clean the walls, then you need to make them smooth. Use the pressure washer and the scraper to remove any residue of the old paint. Wait until the wall dries, then inspect it for any dents or cracks, correct them with caulk and even them out with sand paper. When the wall is flat, clean and dry, you can apply the primer and then the paint. Use these exterior painting tips and you will see that painting is not only a great way to make your home turn heads, but also great fun. What Are the Top Fireplace Manufacturers and Why Do You Need to Know?